When I asked American college student Felisa Erway what she knew about Vietnam before she began her study abroad program, she said “not much.” She said that some of her peers at the university warned her not to go, however. “They said, oh you’re going to get shot,” she recalled. “They’re going to kidnap you. The people are going to see you as the enemy. You know, being suspicious about being an American in Vietnam.” She said that some other university students even told her that Americans had won the war in Vietnam. “A lot of people have false ideas about Vietnam,” she said. While no one in Felisa’s family served in the Vietnam War, she talked with some veterans her mother knew before coming to Vietnam. She was surprised to learn that some of them actually served in the area she was going to live. Felisa said that when she returned to the United States she was going to try to convince some of the veterans and her fellow students to come to Vietnam. She also wants to tell people about the victims of Agent Orange she met in Da Nang and how the war of the 1960s is still affecting people on the ground in Vietnam. Spreading the word about Agent Orange among young people is one of the fund’s main goals, says the fund’s Vietnamese head Nguyen My Hoa. Hopefully the Da Nang/Quang Nam Fund will survive the loss of Ken Herrmann and continue doing good work in Vietnam. You can learn more about the fund here and read some of the 4,000 letters the fund collected from Vietnamese victims of Agent Orange over the years. After visiting the former demilitarized zone in Vietnam in June, I spent some time with the staff of Project RENEW in Quang Tri Province. RENEW — which stands for Restoring the Environment and Neutralizing the Effects of the War — was co-founded by US Army veteran Chuck Searcy and works today on the issue of unexploded bombs in the region just south of the DMZ. Due to heavy fighting in the area during the war, Quang Tri is the province most affected by unexploded ordnance (UXO) in Vietnam today. Project RENEW believes that 60 to 65% of the province’s land is contaminated with UXO. These bombs, which failed to explode when they were first dropped in the ’60s and ’70s, have become de facto land mines and can be incredibly dangerous when discovered. The US military estimates that 10 percent of the bombs they dropped during the war failed to detonate. Considering that the US dropped more bombs on Vietnam than what was dropped on Japan and Germany combined during WWII — the explosive equivalent of 450 Hiroshima-size atom bombs — this is no small number. 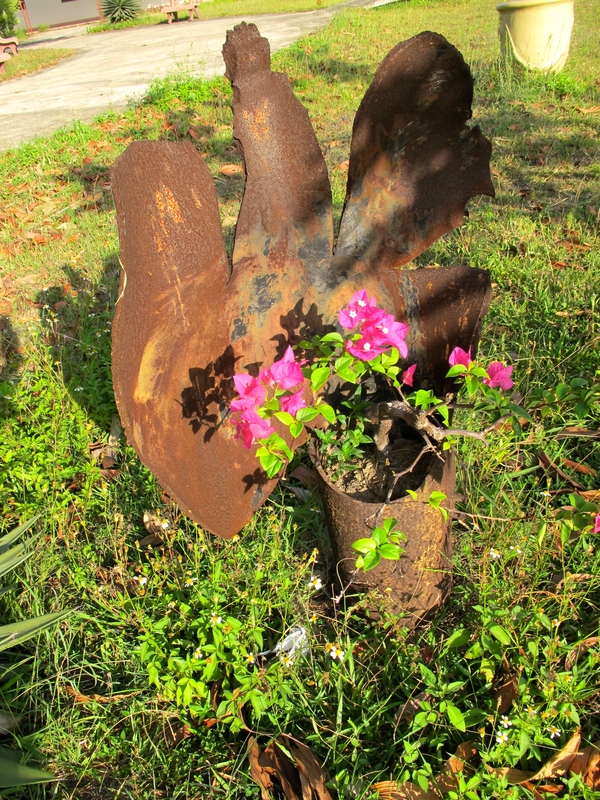 A discarded UXO is used as a flower pot in the garden outside of Project RENEW’s office. (Photo by Nissa Rhee, June 2014). 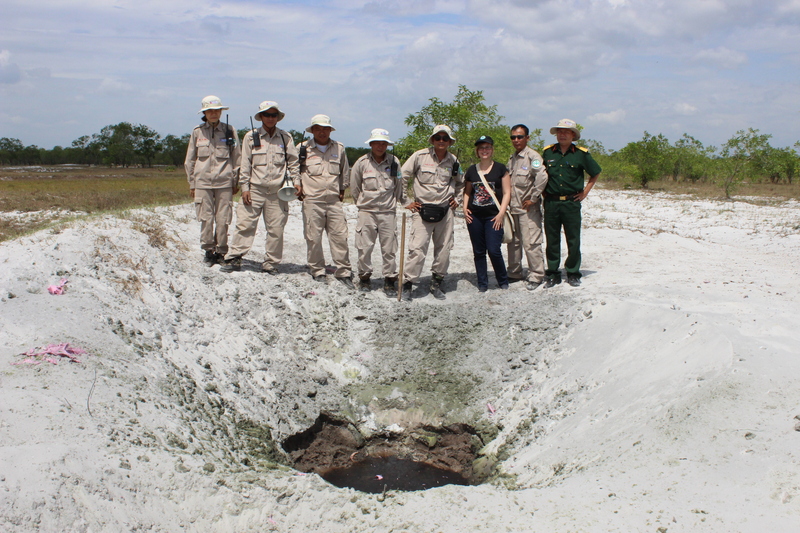 With support from Norwegian People’s Aid, Project RENEW is working to make Quang Tri Province safe by educating the public about the dangers of UXO and systematically finding and destroying ordnance. To understand more about their work in Quang Tri, I met Nguyen Thanh Phu at the organization’s Mine Action Visitor’s Center in Dong Ha. 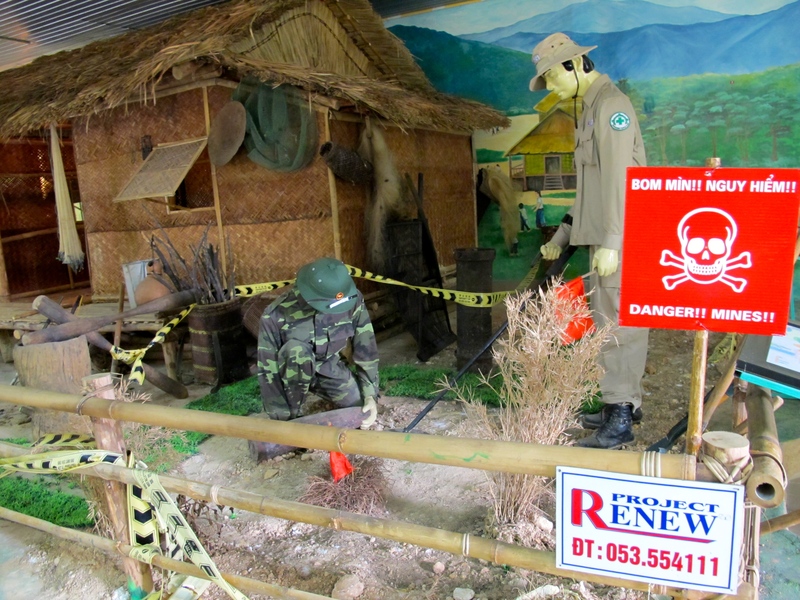 RENEW opened the center in August 2011 and offers school groups, tourists and visiting dignitaries educational tours on UXO. The center showcases a wide variety of unexploded bombs, including the dangerous bomblets that are packed into cluster munitions. 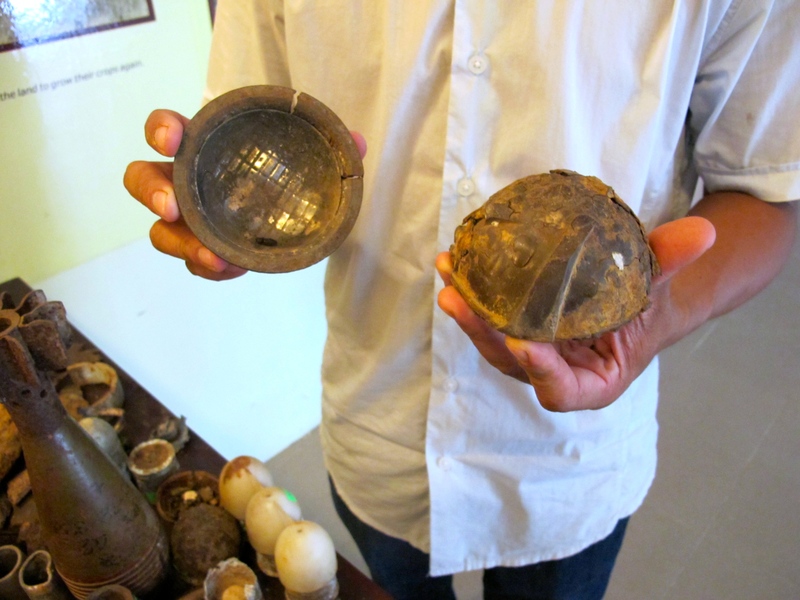 Phu told me that cluster munitions and M79 40 mm rifle grenades cause 45% of the injuries and deaths in Quang Tri today. Both the bomblets and grenades are small and can look like toys to any children who find them. The Vietnamese students who visit the center learn how to identify unexploded ordnance and what to do if they find any wartime bombs. 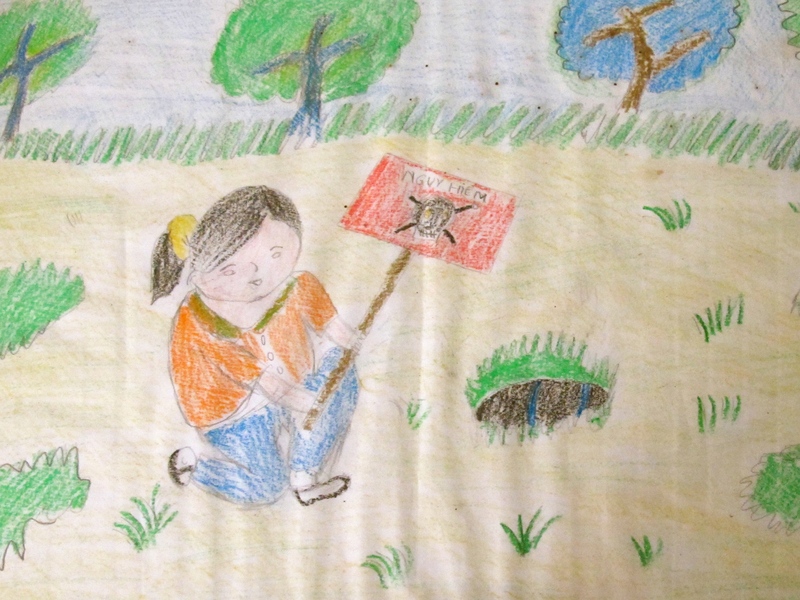 The education program seems to be working: RENEW runs a hotline for reporting discoveries of UXO and has seen calls substantially increase in recent years. Visitors to the center also learn about RENEW’s bomb disposal work, which is led by their explosive ordnance disposal (EOD) teams. 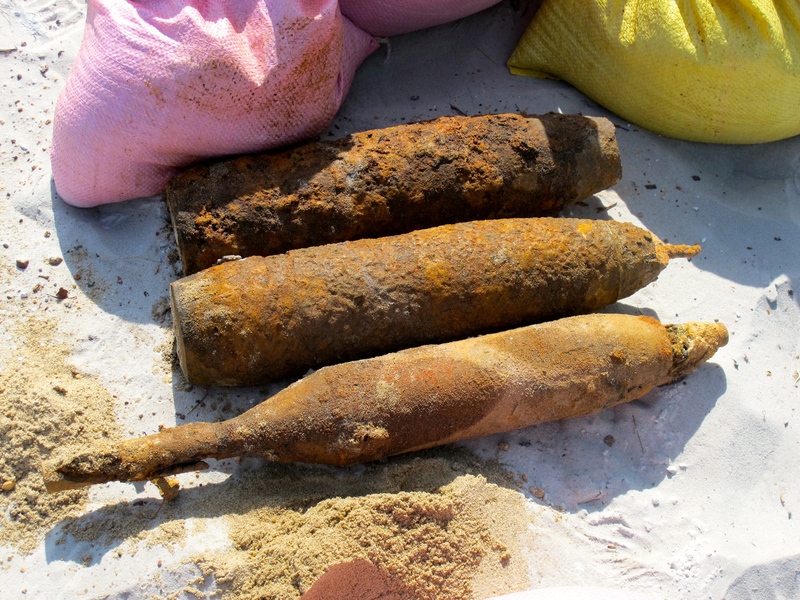 When a piece of UXO is discovered, one of the teams is dispatched to the area to assess whether the ordnance can be safely removed. If they decide it is too dangerous to touch, the team will destroy the ordnance on site, as depicted in the diorama above. If it appears relatively stable, however, the team will move the ordnance to their central demolition site where it will be destroyed at a later date. Since it was founded in 2001, RENEW has also worked with the survivors of bomb explosions to regain their mobility and financial independence. 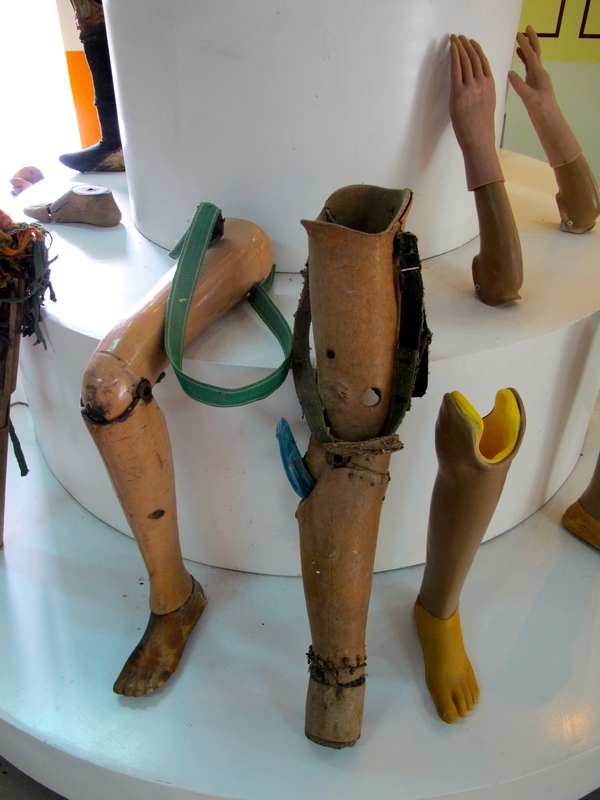 RENEW provides survivors with 2,000 to 3,000 prostheses each year. The organization also started a mushroom farming program that gives survivors the equipment and skills necessary to grow mushrooms at their homes. The mushrooms are later sold at market. 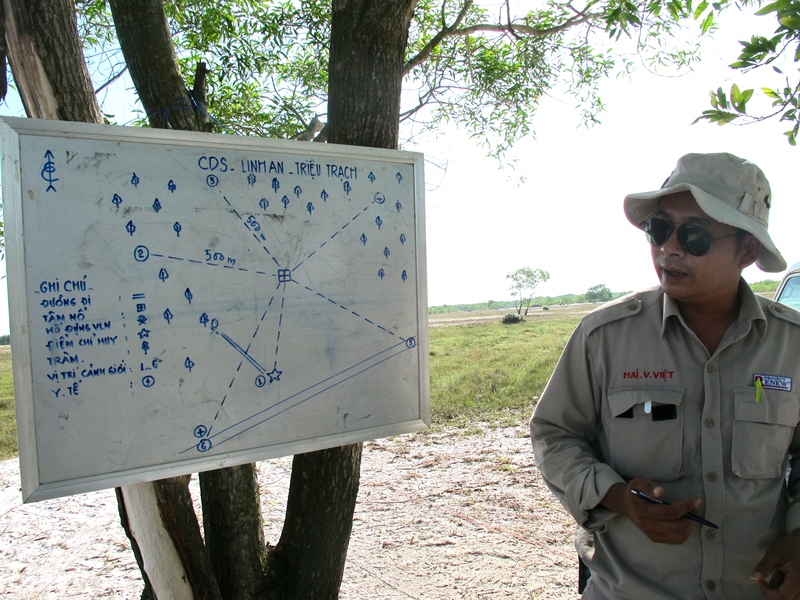 Project RENEW’s Explosive Ordnance Disposal (EOD) Team Leader Mai Van Viet shows me a map of the central demolition site. (Photo by Nissa Rhee, June 2014). After visiting the Mine Action center, I went with Phu to RENEW’s central demolition site to see the work of an EOD team first hand. 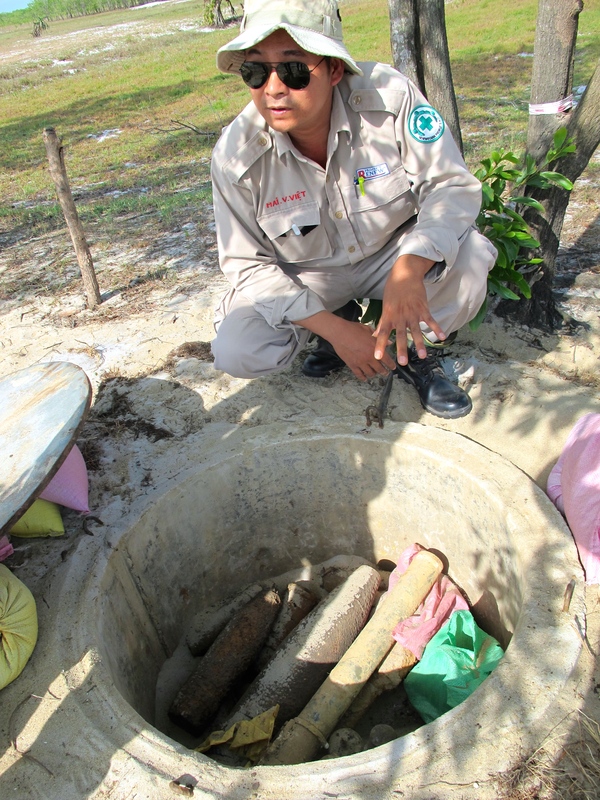 Last year, RENEW’s EOD teams safely removed and destroyed 2,882 UXO in Quang Tri and cleared ordnance from 133 acres of land. At the site, team leader Mai Van Viet showed me the many precautions the team takes before a demolition. All visitors must sign in when they enter the site and provide the team medic with their contact information and blood type. An emergency response vehicle is on hand in case there are any problems. And all cell phones must be put in airplane mode in case the cell signal accidentally triggers one of the old bombs. 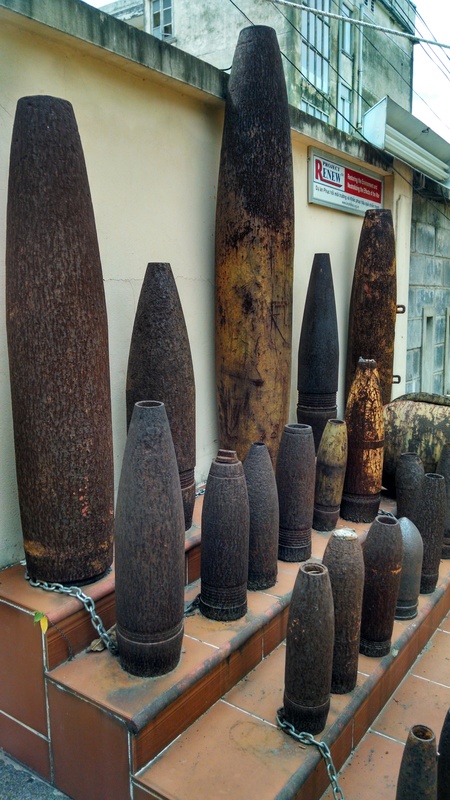 All ordnance brought to the site is stored in a dump until they are ready to be destroyed. Conventional UXO are stored in a dry dump, while phosphorous bombs are stored underwater to prevent any accidental explosions. 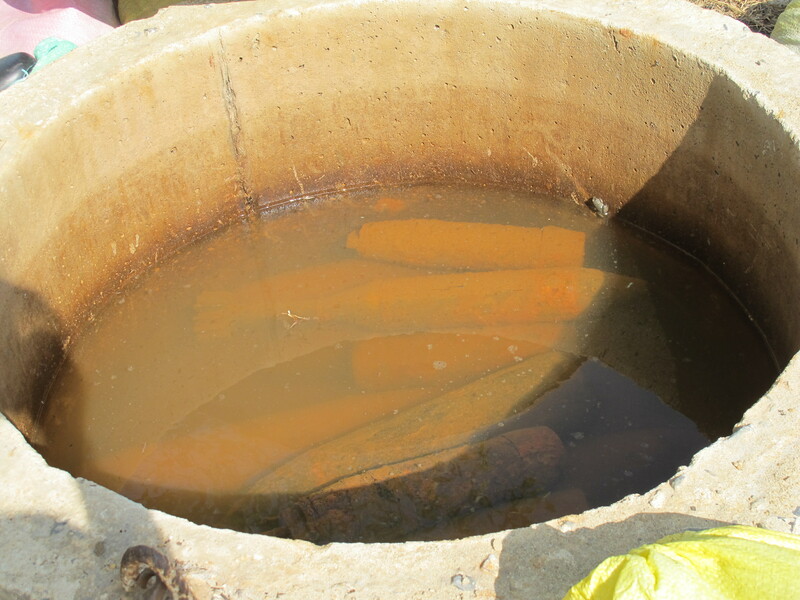 Phosphorous bombs must be stored in a special water-filled dump to prevent them from exploding. (Photo by Nissa Rhee, June 2014). 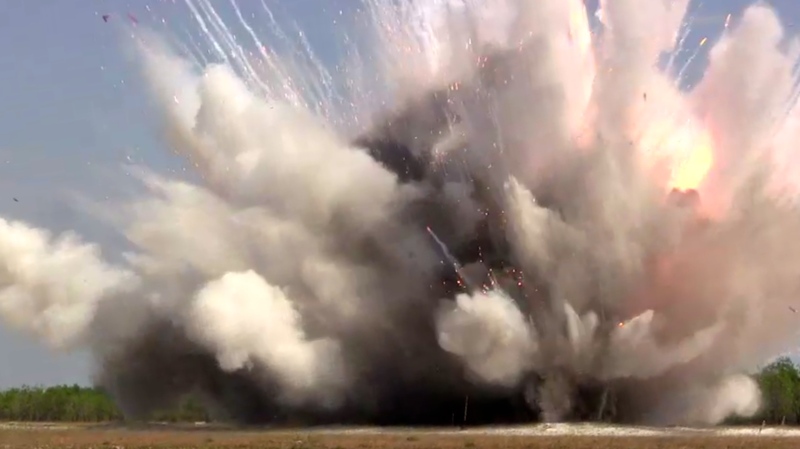 Once the team is ready to destroy the UXO, they move the ordnance from the dump to the center of the demolition site. Multiple bombs are destroyed at once. On the day I visited, the team was detonating several naval artillery shells and white phosphorous bombs (like napalm) — all of which were launched by Americans during the war. 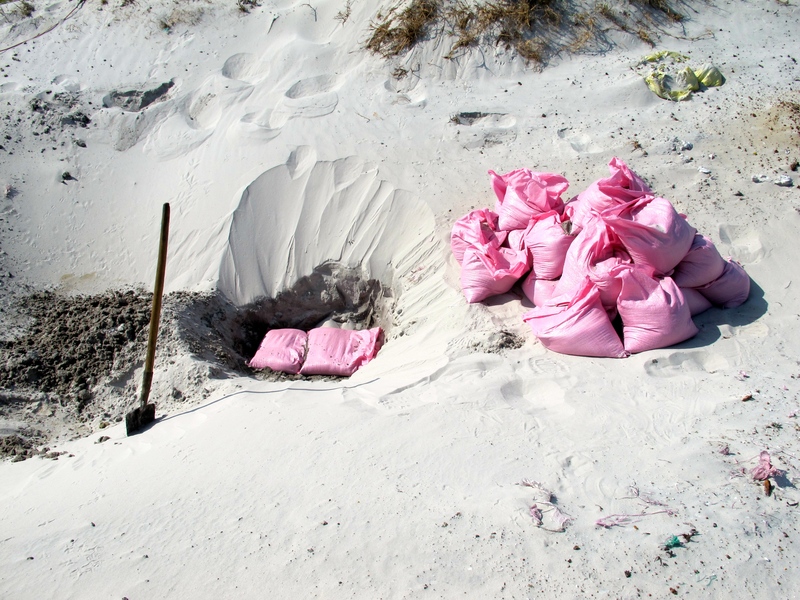 Sandbags are used to muffle the explosion and prevent debris from flying when the bombs are detonated. 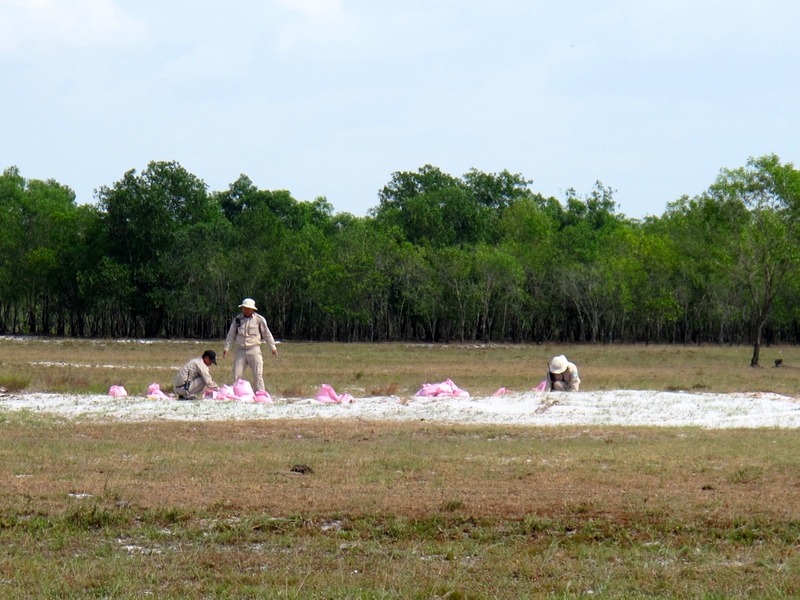 While I was there, the EOD team set up two detonations — one for conventional bombs and one for phosphorous bombs. The phosphorous bombs in particular require a lot of high explosives, since the teams must destroy both the bomb’s casing and booster. Once the explosives have been laid, everyone moves to the set watch posts which are 500 meters away (1/3 mile) away from the planned demolitions. Even from such a distance, however, the demolitions are impressive. When the phosphorous bombs are detonated, they shoot clouds of fire into the sky. After the demolitions, we wait for the all clear before moving to the center of the site. In the distance, I can hear the booms of other explosions. RENEW’s Colonel Bui Trong Hong tells me that it’s the Vietnamese military practicing nearby at one of their bases. With the recent fracas between China and Vietnam in the South China Sea (or as the Vietnamese call it, the East Sea), the military is preparing for the possibility of an armed conflict. “The Vietnamese are peace lovers, but we are always ready to fight,” Hong says with a grin. Hong is the most experienced deminer at the site today — he is certified to level 3 in the International Mine Action Standards and replaced RENEW’s international technical advisor. He is also a veteran of the Vietnamese military and fought with the North Vietnamese military near the DMZ during the war. When Saigon fell in 1975, Hong was one of thousands of people recruited to clear land mines and bombs from much-needed farmland. Their methods were primitive by today’s standards: often they would just stand in a line and use long bamboo poles to poke the land in front of them to find ordnance. The difference between those early efforts at clearance and the work at Project RENEW is stark, with everything from the technology to the people involved changing. After the demolitions, I go with Phu and Hong to visit a UXO victim who was one of the first people to receive help from Project RENEW. 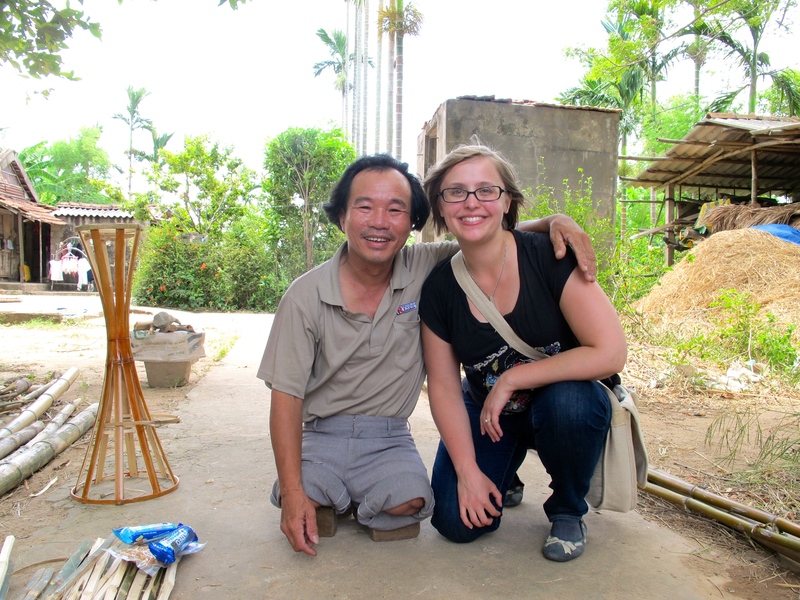 Do Thien Dang lost both his legs when he stepped on a land mine in 1980 while gathering thatch in a field. Dang says that he was traumatized by the accident, which occurred when he was just 20 years old, and it took him a full three years to recover. He eventually got married and got a job selling lottery tickets on the street, but it was difficult work because he had to travel everyday. Then, in 2003, RENEW gave him a “hanging house” to grow mushrooms on his property. The house has given him some financial independence and he can now work from home. 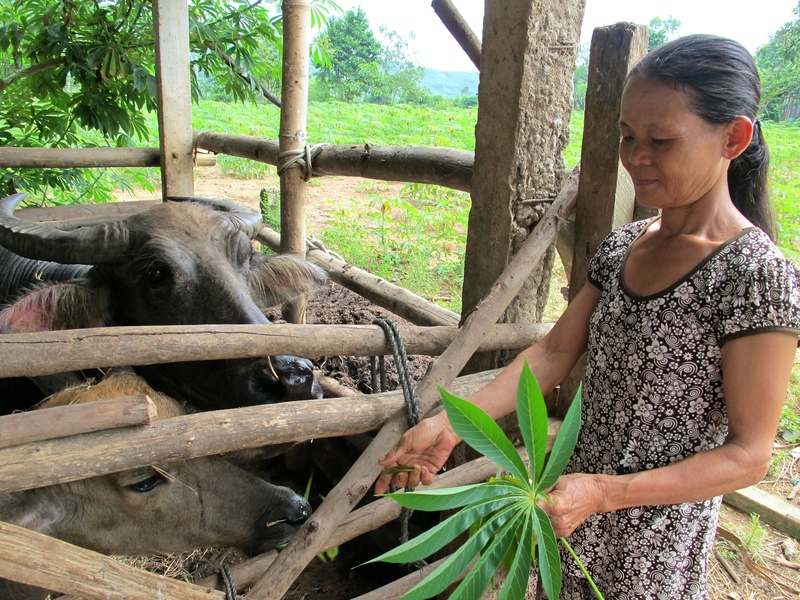 RENEW has provided 194 families with hanging houses since they began their mushroom farming program. Last year, Dang was able to bring in 5 million dong ($236) from his mushroom-growing business. 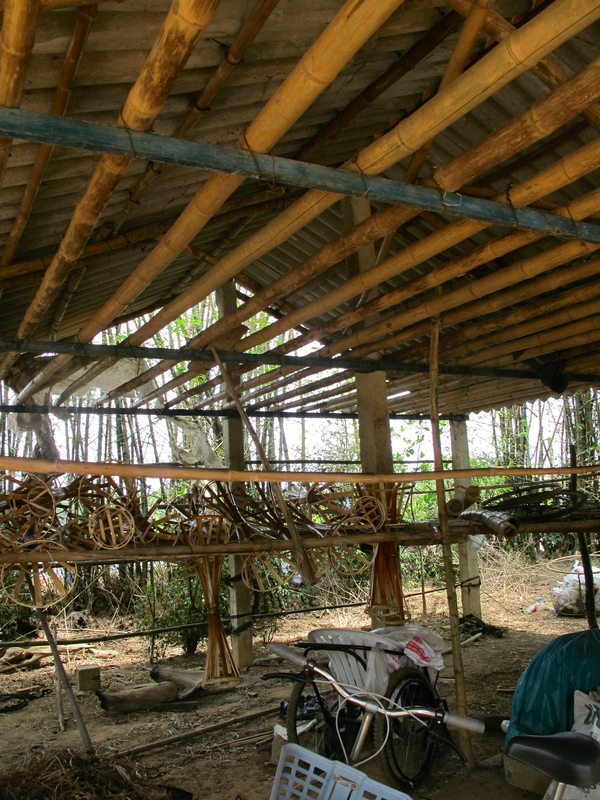 In the dry season — when growing mushrooms is not possible — Dang builds bamboo stands for floral arrangements, which he sells at $1 a piece to local florists. When I ask Dang if he remembers meeting US veteran and RENEW cofounder Chuck Searcy, he smiles and nods. Nearly fifty years have passed since the My Lai massacre, but many Vietnamese in Quang Ngai Provence are still suspicious of or even hate Americans today. 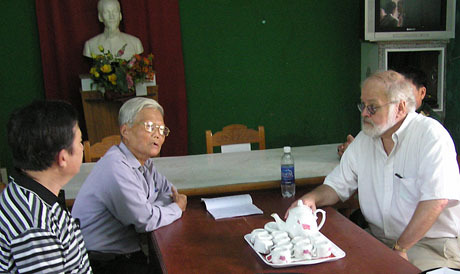 US Army veteran Mike Boehm‘s Madison Quakers, Inc organization is trying to overcome those negative feelings and build friendship and understanding between Americans and Vietnamese in Quang Ngai. 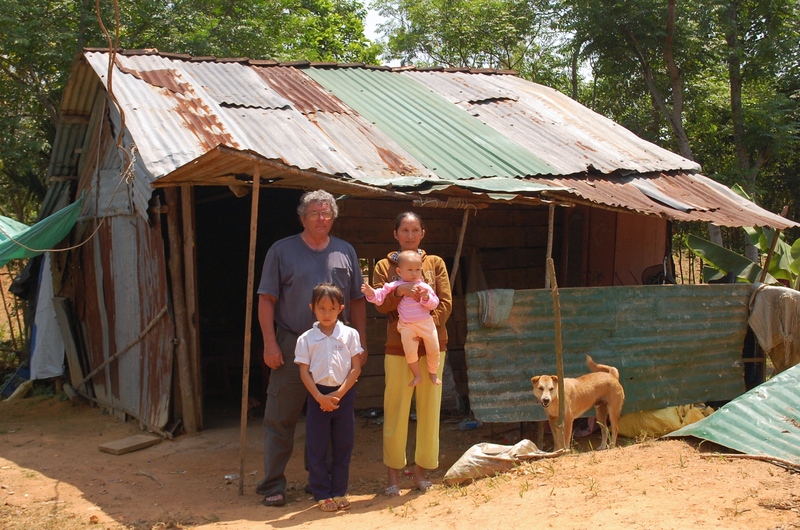 Mike started working in the provence 20 years ago when the Quang Ngai Women’s Union asked for his help in starting a micro-credit loan project. He partnered with English professor Phan Van Do and together they have developed a wide range of humanitarian programs in the provence. Mike estimates that MQI has raised and donated over $1.5 million to projects since the organization began. When I visited Quang Ngai last month I got to see some of their work, including a series of water wells in Nghia Tho village. The people who live in the village are from the H’re ethnic minority and more than 69% of the population live in dire poverty. Previous attempts by groups to build wells in the area failed because of the hard bedrock, which kept the wells empty during the dry season from May to August. 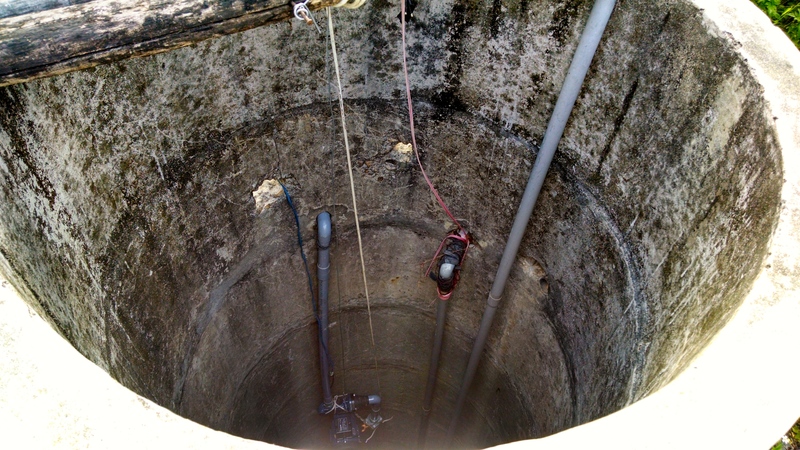 Through hard work and persistence, MQI was able to overcome this problem by drilling through nearly 300 feet of granite to reach a constant flow of water. Do says that thanks to the wells, thousands of people now have ready access to clean water. The United States sprayed Agent Orange and other herbicides in Quang Ngai during the war, and these chemicals are continuing to affect the people living in the provence today. I visited a school run by the local branch of the Vietnam Association of Victims of Agent Orange (VAVA), which MQI has donated to in the past. The school currently has an indoor playground with physical therapy machines, but MQI is trying to raise money to build them an outdoor play area as well. A Vietnamese proverb states: “For a profit in ten years, invest in trees. For a profit on a hundred years, invest in children.” MQI took this to heart when they built the My Lai Grammar School. When MQI first visited the site where the school now stands, it was just an empty field with a few houses. Now, it it home to the most popular primary school in the area. 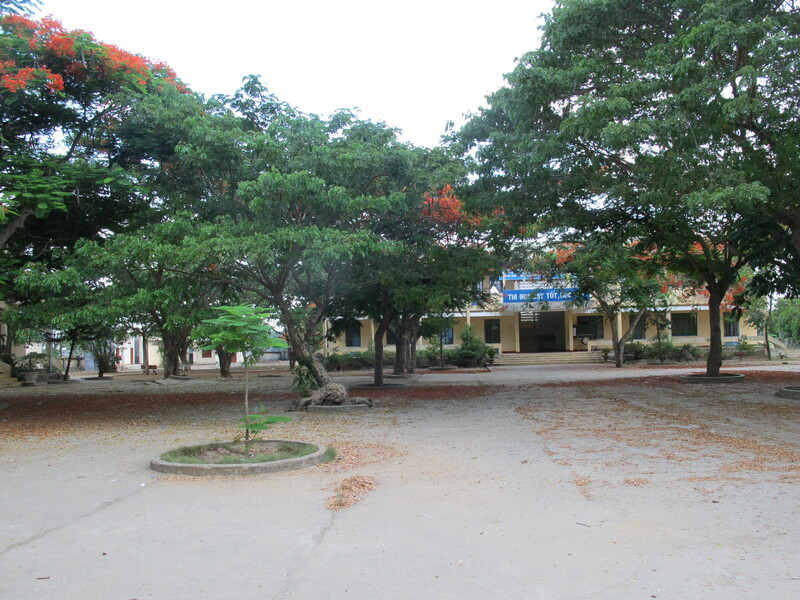 It has three buildings with a total of 16 classrooms. US Army veteran Hugh Thompson — who helped stop the My Lai massacre — donated money so the school could have indoor bathrooms. 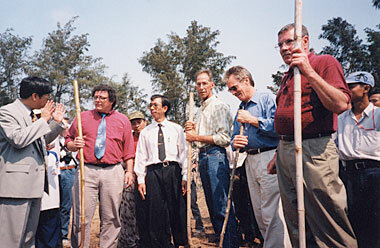 Hugh Thompson along with Larry Colburn — a member of Thompson’s helicopter crew who intervened in the My Lai massacre and helped save civilians — attended the groundbreaking ceremony for the peace park. 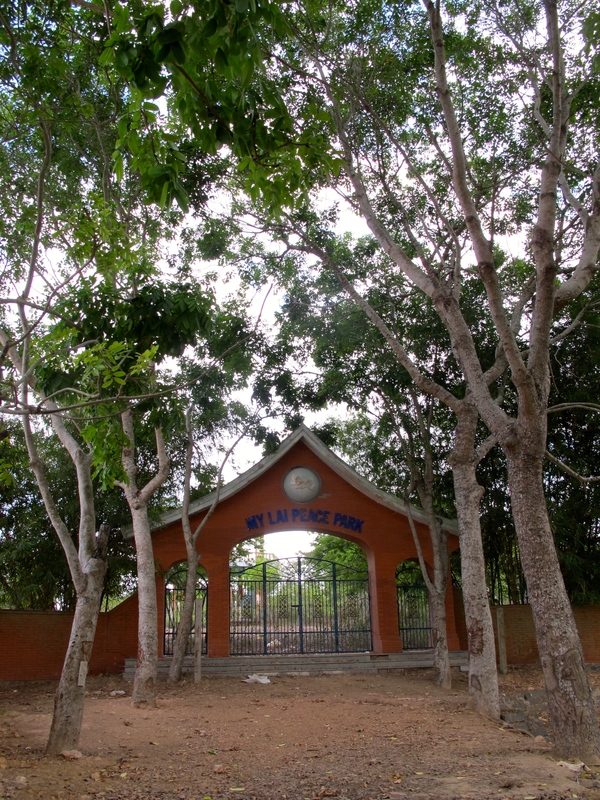 Along with some of the Vietnamese survivors of the massacre, the veterans planted the trees that line the road to the peace park. 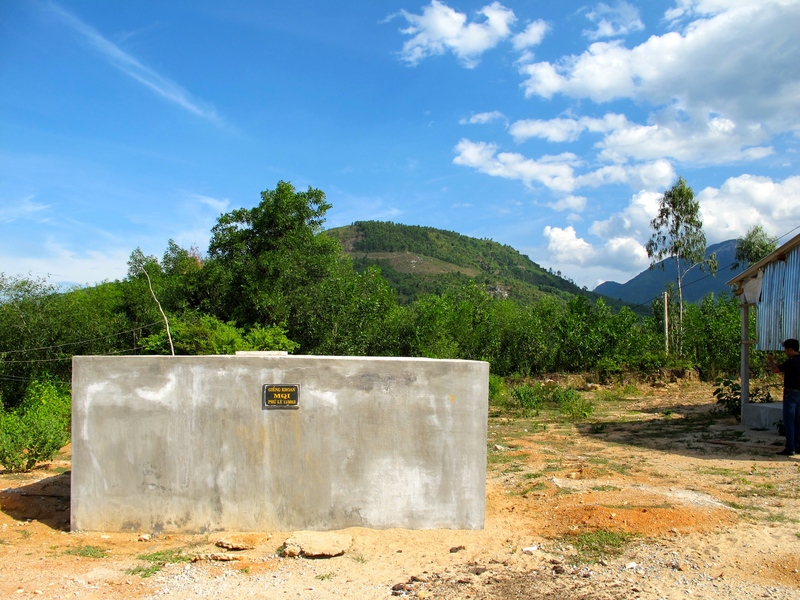 One of MQI’s biggest projects has been building “compassion houses” for very poor families in Quang Ngai. 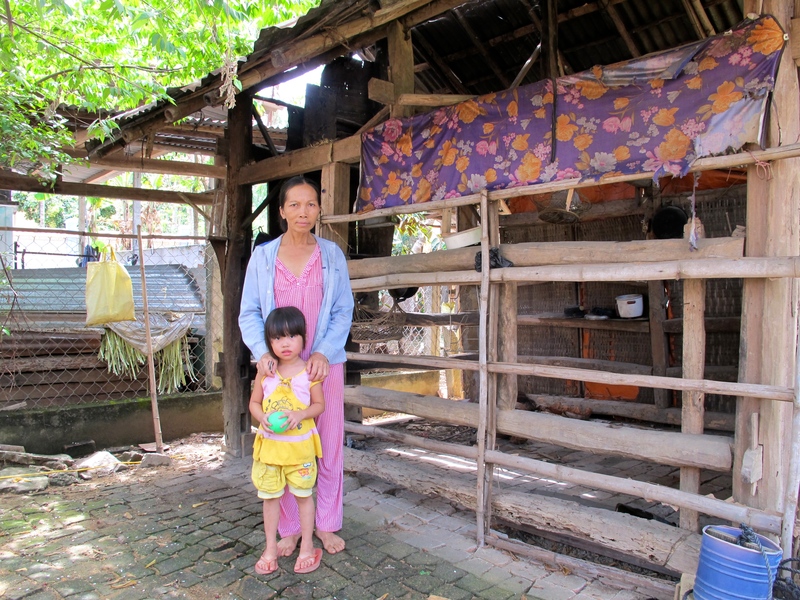 These simple cement houses often replace ramshackle structures, which would fall apart during typhoon season. 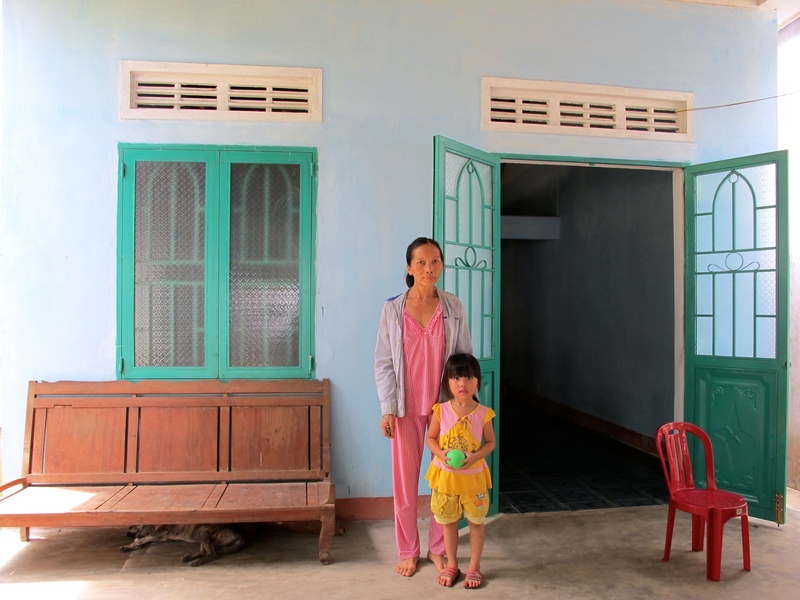 I visited one family who is in need of a compassion house in Tinh Giang commune. The head of the family is a single mother and she told me that she’s worried that her house might collapse and hurt her two children. MQI is now working with her and they hope to build her a new, safer house soon. The difference between an old house and a new compassion house is stark. Where wooden planks and corrugated metal once provided shelter, new homes have cement walls with separate rooms, glass windows, and metal doors. 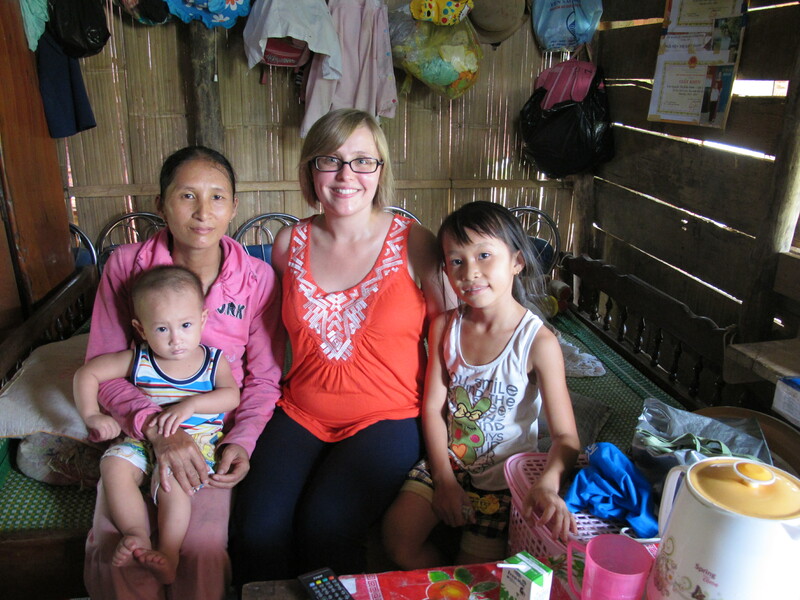 MQI still works closely with the Quang Ngai Women’s Union, who help Mike and Do identify families in need. I visited one family identified by the Women’s Union that was able to purchase a female water buffalo through a micro-credit loan from MQI. The buffalo has given birth to a calf and is pregnant once again. The family told me that if they sold the buffalos today, they could get $1,500 for the mother and $700 or $800 for the calf. The is a substantial amount of money for the family and will make a major difference in their lives. 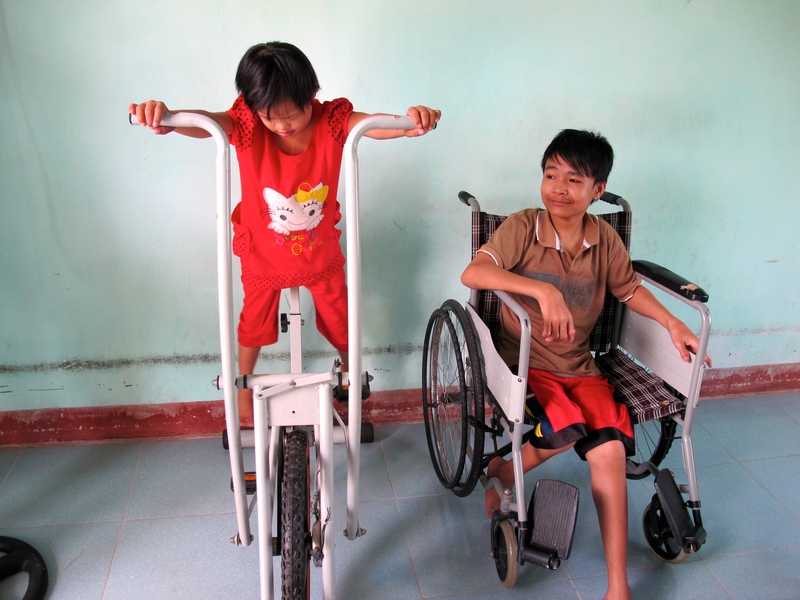 If you’re interested in learning more about Mike and Do’s work in Quang Ngai, please visit their website. There, you’ll be able to watch the award-winning documentary The Sound of the Violin in My Lai, which features Mike, and learn how to donate to their projects.